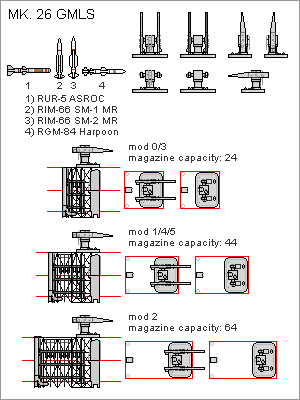 I've been drawing and modding a lot of parts recently for an upcoming project and these have been uploaded to the SB wiki http://shipbucket.com/wiki/index.php/Main_Page after some fellows on the Discord liked them, so I wanted to share these with the whole forum in order to draw attention to the wiki and to get your comments, and specially criticism as I hope everyone can use these parts on the drawings that need them. Also please do use this thread to post new parts, this will let the forum know there's something new in the Wiki (you'll upload it to the wiki first, right?). All of the images come with a colour palette for easy recolouring. DISCLAIMER: These parts represent the fit on JMSDF Hatsuyuki-class Destroyers, always check your particular installation for specific details. FCS2-12 fire control dome for RIM-7 Sea Sparrow. Civilian band SatCom, should be able to represent fits for many countries but check your references. Air search radar, distant descendant of AN/SPS-6, other marks exist. Surface search radar with limited low-level air search capability. Medium frequency sonar on dome. Block 0 model without framing around the gun barrels. 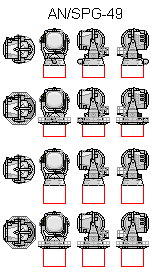 I only modded the side views seen in the parts sheet to better represent what I've seen in photographs, but the front and top views were done by me. Mark 75 76mm/62 gun, can represent gun in USN or JMSDF service, check the base of the gun in particular for your installation. This one was modded from the existing part. OTO Melara Compact 76mm gun, not in JMSDF service but it took basically no effort to make this one out of the Mk 75 as it's only missing the vent above the rear hatch. Ship's boat, usually seen hanging from davits. This one differs from the previous part in details and by having rhomboid shaped vents on top, other models have mushroom vents or don't have them at all, check your photographs! Very close in dimensions to the old McConrads part, but with detail added, skirt around the rotating base is different on some launchers. Hope you like them, and if not, do let me know! Making use of this excellent thread (and with permission from Charguizard), I post here a list of parts I and others have updated, which were posted on the wiki but not on here yet. I will try to keep doing so when updating/creating parts, so people get notified of updates and have a chance to comment. Keep in mind: the wiki will always be updated first, so the best place to look for the latest parts will always be there, not this thread. I think that is all that has not been separately posted up here so far.